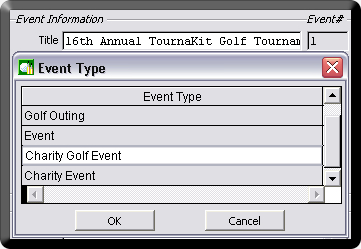 Easily manage all aspects of your charity golf event by taking advantage of TournaKit Pro's integrated event data. 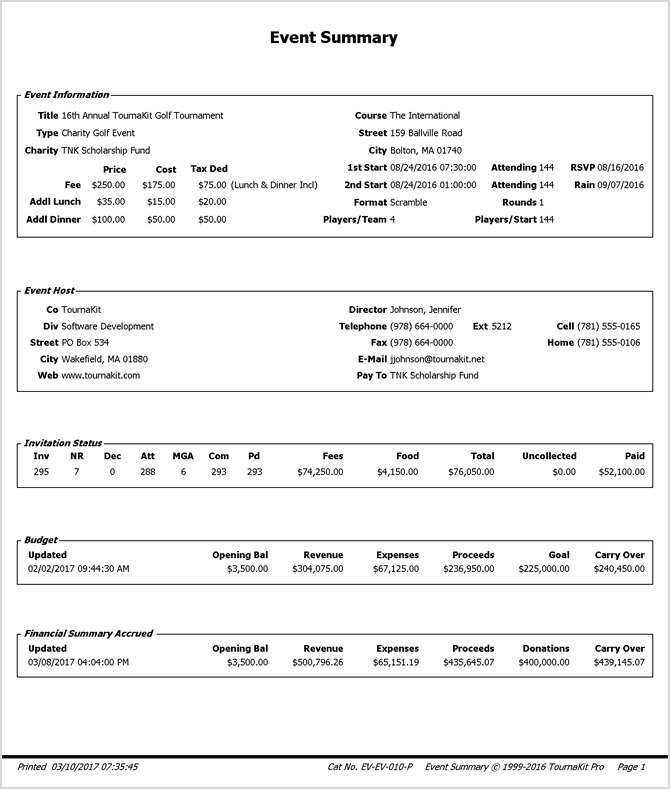 Each event provides a complete set of financials and systems for managing player invitations, golf registration check-in, event wide invoices and receipts, tournament sponsor packages, auctions, raffles, group email, golf cart pairings and hole assignments, donations, contests, committees, volunteers, and account manager's goal tracking. 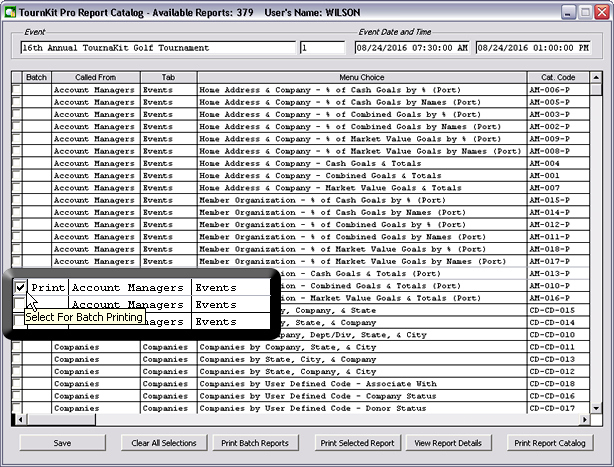 The 'Events' section creates a primary record for each event. The page tabs you see on top of the screen are all related to the currently selected event. Four 'Event Types' control the look and feel of the user interface. From here the event's primary information is generated for all the related sections of TournaKit Pro. The initial setup for your charity golf tournament can be completed in minutes, simply enter the basic tournament information such as location, start time and date, golf fees and your costs. 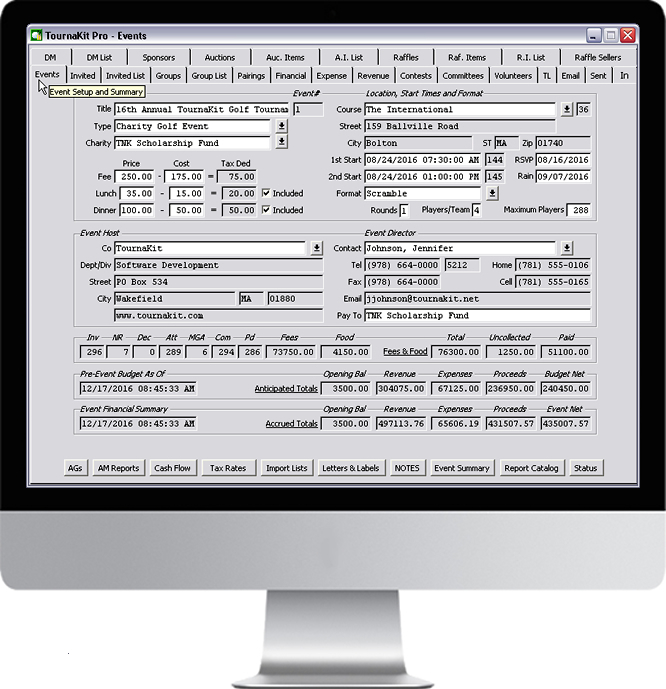 TournaKit Pro will automatically calculate invoices and receipts with tax deductions included (optional). The bottom of the 'Events' screen provides a snap shot of your invitation status, pre-event budget, and financial summary based on accrued totals. 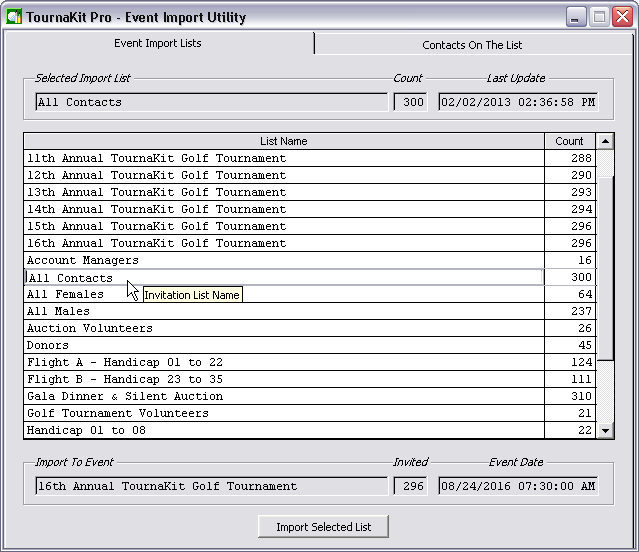 Print your charity golf event's financial summary and invitation status report using the quick access command buttons on the bottom of the 'Events' page. TournaKit Pro's Event Import Utility is a popular feature that allows you to create invitation lists based on a variety of critera. This feature is commonly used to replicate the previous year's charity golf tournament. TournaKit Pro comes with 386 reports. 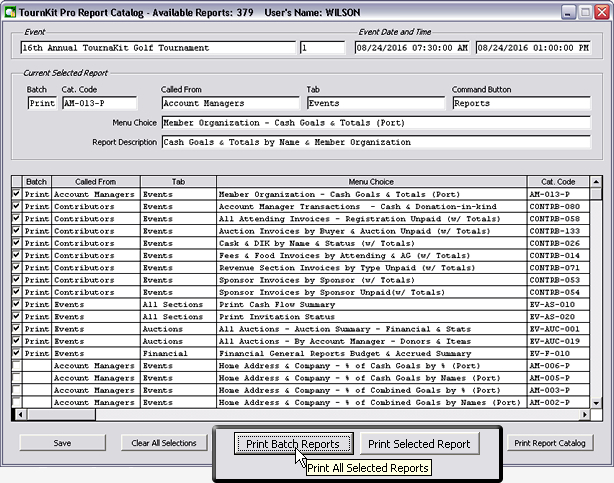 The Report Catalog saves you time locating your favorite reports and provides batch or single report printing.